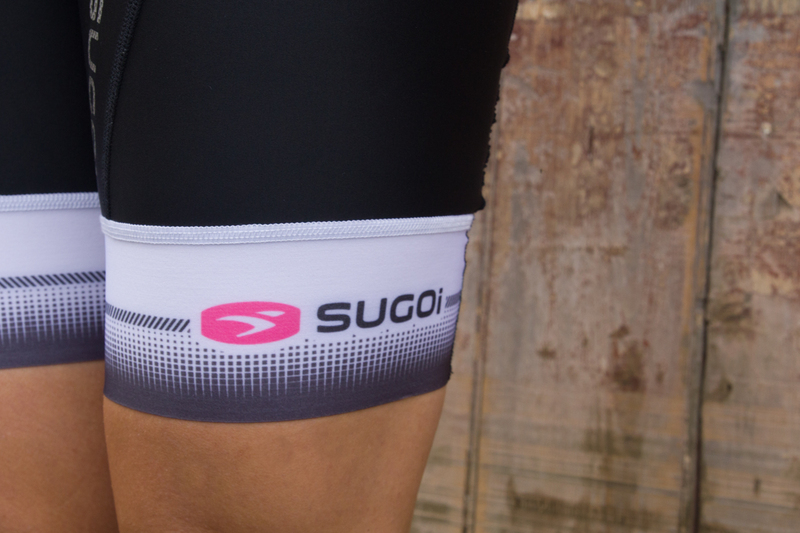 Alongside testing the entry level Sugoi women’s cycle kit, I’ve been trying out the top of the range RSE women’s cycling shorts and jersey and as I mentioned in my earlier post, I’ve been delighted with both how they look and how they feel. I prefer to wear shorts rather than bibs in the summer as I find the extra material of over shoulder bib shorts makes me rather hot – I’d rather just have the jersey against the skin of my torso. I also like my cycling shorts to be multipurpose; I often wear them under regular shorts for extra comfort on casual rides and I prefer not having to get totally undressed to go to the bathroom. The Sugoi women’s RSE shorts are on the steep side at £104.76, but they’ve held up well over the summer months and as they’re such good quality, I kind of feel like they’re worth the big bucks. I really like the way they look and when paired with the Sugoi Women’s RSE jersey, you feel rather dapper. The FXE chamois pad is seam free, comfortable and doesn’t feel at all bulky. It has little dimples in it which seem to help distribute pressure evenly and the gel padding hasn’t creased like some of the other shorts I’ve tried. All in all, it’s a very comfortable chamois. The shorts are made from ten contoured panels that give a really good fit and though they come up high enough at the back, they’re not ridiculously high. The material itself feels light and cool and the waistband is comfortable and doesn’t dig in at all. Flatlock stitching is soft and doesn’t chafe. Apparently the shorts use ‘Ultra Profi Fabric construction’ for a compression effect to encourage good circulation on endurance rides. I can’t say I particularly noticed this. The wide, soft legbands are seams free and like the cuffs on the jersey grip gently without leaving marks on your skin. I much prefer this kind of cuff on cycle kits – the stitched kind with a thin strip of gummy rubber on the inside irritate my skin, feel uncomfortable and don’t look as good. I’ll be posting reviews of Sugoi’s budget line for comparison and whilst I also liked it, for me the RSE wins despite it’s high price. The kit feels so cool and comfortable and looks pretty pro, so it’s an all round winner as far as I’m concerned. The only thing I wasn’t crazy about is those little t-shaped reinforcements.